Recent Team HRC MXGP signing Brian Bogers suffered a small crash in Rome on Thursday 23 November whilst riding at the Ponte Sfondato track. He was immediately tended to by track medical staff, and transported to the local hospital before moving to a specialist clinic. There, a foot specialist familiar with operating on sportsmen conducted a two-hour surgery on Thursday night to repair Brian’s right foot. He had suffered a complex fracture-dislocation of the right foot, and the first surgery effected a temporary reduction and fixation. Teammate Calvin Vlaanderen joined Brian at the specialist clinic for support until members of his family and from Team HRC arrived on Thursday night and Friday morning. Bogers returned home to Belgium on Sunday 26 November, and received further medical checks from Dr Toon Claes. On 4 December he was operated on by Dr Claes to effect a full reduction and fixation on the foot. 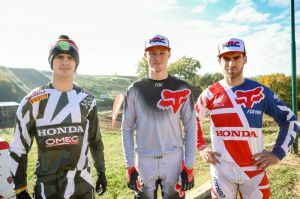 Brian and Team HRC are working on a timeframe of three months to return to riding, with a view to making his factory team debut aboard the #5 Honda CRF450RW as soon as practically and safely possible after that. Honda and HRC are fully supporting Brian in his full recovery and return to racing.